Mylan has been accused of participating in a vast price-fixing conspiracy to keep prices of medications artificially high. Indian drugmaker Emcure Pharmaceuticals Ltd. and its subsidiary, Heritage Pharmaceuticals, are also implicated in the conspiracy. In a new 243-page complaint, the states described how the drugmakers worked together to share the market, including agreeing to raise or maintain prices for specific drugs in tandem. The executives are alleged to have made these agreements at industry conferences, over dinner parties, and through hundreds of phone calls, emails, and text messages. When Heritage launched an antibiotic called Doxy DR in 2013, Mylan, then the only other generic maker with a pill on that market, agreed to give up two large accounts to the company to help it enter the market without putting pressure on prices. 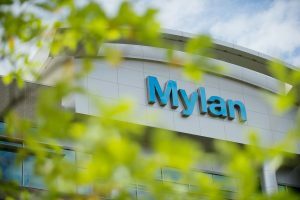 As part of the agreement between the two companies, Mylan would be allowed to enter the market for another drug without competition. The states said in the complaint, “The competitors understood that this agreement would allow Heritage to gain market share without eroding the lucrative Doxy DR pricing in the market at that time.” Malik’s lawyer said that the executive “emphatically and categorically denies the allegations in the complaint.” Representatives for Emcure didn’t respond to requests for comment. The civil investigation is running parallel to a criminal probe by the U.S. Justice Department. Two former executives of Heritage have already pled guilty in the criminal case. Other managers in the industry are also under investigation. Mylan’s shares fell 6.6 percent after the latest announcement, its biggest intraday drop since November 2016.